When the engine is running the coil produces a high voltage electrical pulse which goes to the distributor and eventually arrives at a spark plug, produces a spark, and ignites the fuel. 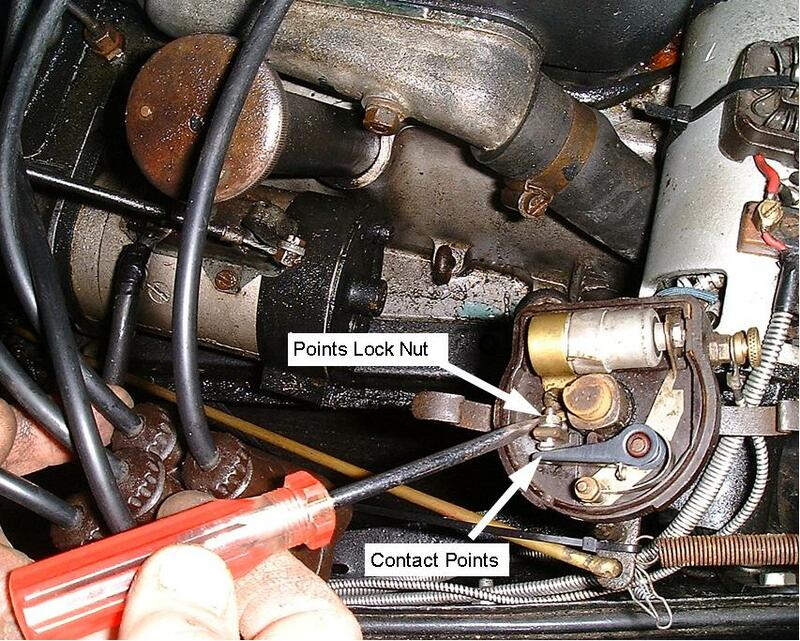 The king lead conducts the high voltage pulse from the coil to the centre (top) terminal on the distributor cap. 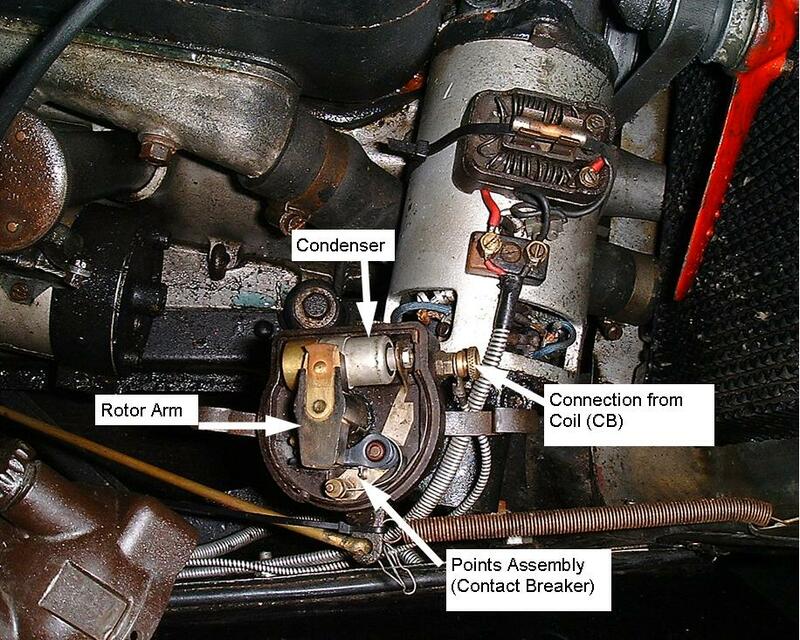 The rotor arm under the distributor cap transfers the high voltage pulse from the centre terminal to each of the outer terminals, in turn, from where they pass via the high tension (HT) leads to each plug. The firing order, starting from the front of the engine, is plug 1:3:4:2. The low voltage connection (6V) from the coil enters the distributor via the screwed connection on the side and is connected to the end of the condenser and via the metal link on the baseplate to the post on the points assembly. This in turn is connected via the spring and points arm to one side of the points (contact breaker). The rotor arm is removed by pulling it upwards. NB When replacing make sure that it is correctly located on the shaft and pushed fully down. Distributor maintenance is important. There should be a gap of about 12 thou (roughly credit card thickness) between the points when the “foot” on the points arm is “pushed away” by one of the four cam lobes on the centre spindle of the distributor as it rotates. If there is no gap, or a reduced one between the contact points then a spark will not be produced at the plugs. To make the correct gap the points lock nut should be loosened which will allow the points screw to be turned in a clockwise direction to open the gap to the required distance. 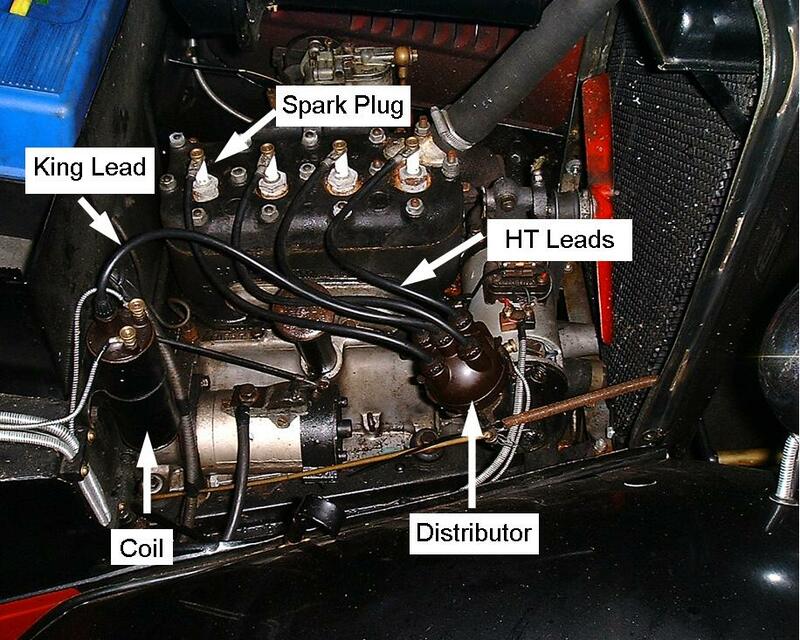 Finally the high voltage current leaves the distributor through the HT leads to each of the spark plugs which turn the electrical pulse into a spark inside the engine cylinders; this causes the fuel to explode and push the piston down. This article, prepared by Andrew Jarmin, was the subject of a Teach-In. Refer to Technical Articles for links to other electrical topics.